The Bichi altarpiece, from the church of Sant’Agostino in Siena, dates from 1488-90. Originally consisting of a wooden statue of St. Christopher by Francesco di Giorgio and several paintings by Signorelli, the various pieces of the Chapel were dispersed in about 1775 and are now in several different museums. 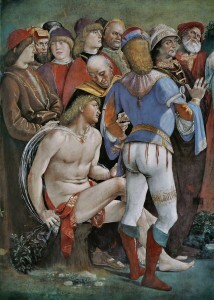 The definitive account of Signorelli’s life and work in English is Tom Henry’s The Life and Art of Luca Signorelli (New Haven and London: Yale U P, 2012). An truly beautiful book by a first-rate scholar, Henry’s study includes a reconstruction of the chapel on page 74. 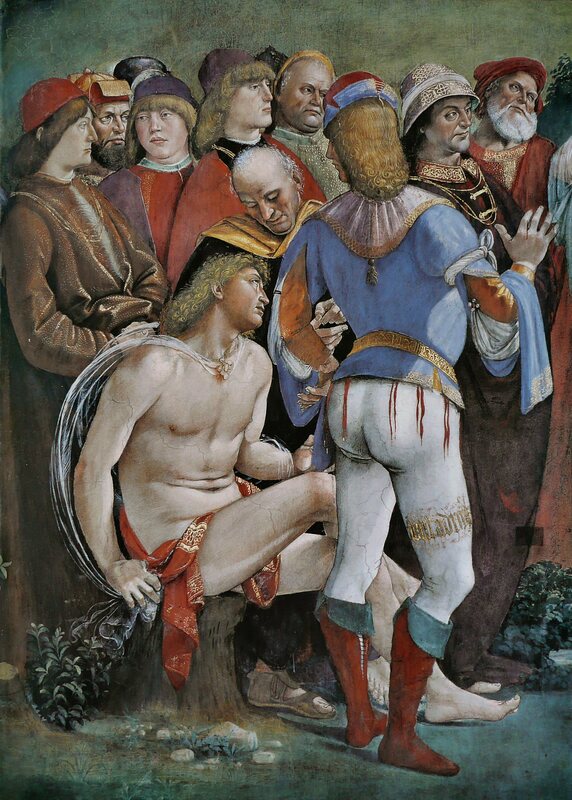 Fun fact: the two pieces in Toledo were originally thought to be scenes from a baptism of Christ, as such scenes provided Renaissance artists with the opportunity to portray male nudes. An obvious precedent for Sigorelli’s iconography is his teacher Piero della Francesca’s Death of Adam fresco from the Legend of the True Cross cycle in Arezzo. Martyrdom of St. Catherine of Alexandria, Clark Art Institute, Williamstown, MA (misdated). Hilariously, the Museum has a quite good you tube video of the piece, which, in the caption and video title page, misdates it, but in the oral commentary, does not!